The fall 2016 scientific studies aboard the Canadian Coast Guard Ship Louis S. St-Laurent were part of an international program that conducts annual surveys in the Beaufort Gyre – a portion of the southern Canada Basin, north of Alaska, whose water circulates clockwise. Scientists on board were seeking to understand the impacts of climate change in the Beaufort Gyre. Over this month-long journey, 26 scientists successfully recovered and redeployed three moorings, completed 65 rosette casts at 53 locations, launched 59 expendable CTDs, collected zooplankton net tows at both 100 and 500 meter depths, and deployed 40 ocean drifters. Participating organizations were: JOIS, which stands for Joint Ocean Ice Studies, an important Canadian contributor to international Arctic climate research through the Beaufort Gyre Exploration Project (BGEP), a partnership with Woods Hole Oceanographic Institution (WHOI), and the Pan-Arctic Climate Investigation (PACI), a co-operation with Japan Agency for Marine-Earth Science and Technology (JAMSTEC). To maximize their time during Arctic operations, science crews work around the clock, conducting research 24 hours a day. The scientists split into two groups, affectionately known as the Day Watch and the Night Watch, and work twelve-hour shifts – from noon to midnight, and midnight to noon respectively – ensuring all opportunities to collect data are taken seized. Although detailed analysis of samples is usually completed in fully equipped labs after missions, several Canadian Coast Guard ships – including the CCGS Louis S. St-Laurent – are outfitted with interim labs on board so researchers can immediately examine and study specimens or data collected. Meet Mike Dempsey. Mike is a scientist from Fisheries and Oceans Canada and the lead for the 2016 JOIS expedition’s Night Watch team. Here, he relates his favourite memory of incredible, sparkling Arctic ice from one of his trips to the North. Some members of the JOIS expedition share their experiences with ice, and while many report that over the years the ice has been getting thinner and thinner and sightings of it rarer and rarer, it seems it’s not enough to dampen the sheer wonder the Arctic excites among its visitors. Steve Page is a research scientist at Fisheries and Oceans Canada and was part of the Night Watch on this year’s JOIS mission. Working at the hands of the CTD rosette, he knows just how important long term data collection and analysis is to better understand changing Arctic waters. XCTD probes collect highly detailed oceanographic data – including water temperature and salt content – from moving platforms, like the CCGS Louis S. St-Laurent. Here, Alec has just shot the probe into the water by a launcher and monitors as it gathers data and transmits it back to the ship through the transmission wire. 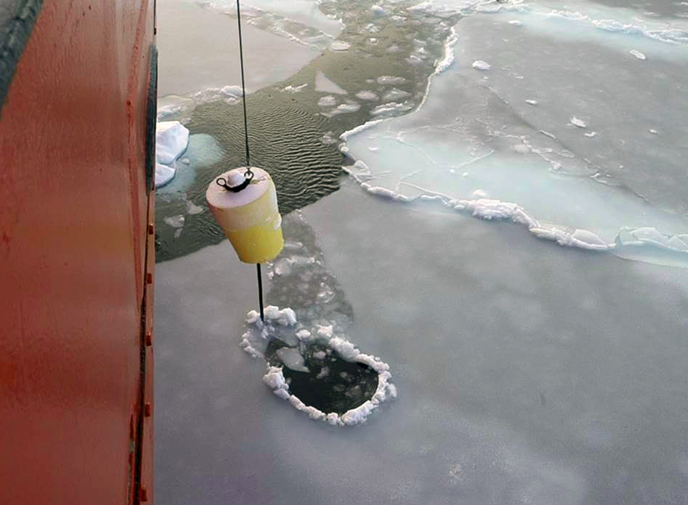 Descending into the cold abyss is a regular job for the rosette, which is the primary instrument for ocean monitoring. As the rosette is lowered and raised through the water column, it collects information on conductivity, temperature, and depth, among others. Rosettes also collect water samples at different depths on their return voyage to the surface. Water is stored in a series of large containers, where back on board it is then transferred into smaller samples for analysis, giving researchers insight into the various chemical and biological properties of the water in a specific area. These bongos don’t make music, but they do work in perfect harmony to collect zooplankton. As seen here, these side-by-side sampling nets catch plankton while skimming through the water, and are then hosed down into small buckets for later analysis. Kelly Young studies marine zooplankton, to try to identify the community and life cycle of these tiny creatures. Zooplankton are typically microscopic but can grow to the “sizeable” length of a couple centimeters, making them almost as near to the bottom of the marine food chain as you can get. With swimming appendages too small to swim effectively against currents, they dart short distances in bursts of energy, as seen here. Sarah Zimmermann, Chief Scientist on this trip, is from Fisheries and Oceans Canada’s Institute of Ocean Sciences in British Columbia. Despite the setbacks because of the thin ice cover this year, Sarah was still pleased with all the data they we’re able to collect over our month long journey – data that will be added to the existing 14 years of material from JOIS, which gives us a better understanding of what’s happening in this area of the Arctic. Moorings that have been in the water for a year are recovered in a long day. The anchor and all the line has to be retrieved from 12,000 feet below. The Crew and the Woods Hole Scientists work together on the foredeck of the Louis recovering and redeploying a mooring.